The primary purpose of the use of personal protective equipment (PPE) is to protect workers against hazards that cannot be eliminated or adequately reduced by other means. While designing and selecting PPE it is extremely important to know and take into account the principles of ergonomics, which can ensure the acceptability, and by extension the use of PPE. On the other hand, the PPE placed on the market should be evaluated in terms of ergonomics and the potential impact on the user1,2. Ergonomic properties are also of great importance, as glove fit and comfort of use affect manual dexterity and work safety3. The choice of methodology is critical in evaluating the ergonomic properties of protective gloves4. Currently, those properties are assessed based on two methods specified in safety standards, that is, the dynamometric grip and pull test according to EN 1082-2:20005 (glove fit and anti-slip qualities); and a test involving the picking up of pins with varying cross-sectional diameters according to EN 420:2003+A1:20106 (finger dexterity). In the standard EN 420:2003+A1:20106 method dexterity is measured only with steel pins, each 40 mm long and respectively of 5 mm to 11 mm diameter. The pins shall be placed on the flat surface, and a trained operator wearing gloves shall pick up the appropriate pin by its circumference. The test results correspond to the smallest diameter of the pin that can be picked up. They do not reflect fully the characteristics of gloves as regards their ergonomic properties expected in the case of manual work, for which a higher level of such properties is desirable. These tests, however, lack objective indicators, and their results consist of the subjective assessment of sensations associated with upper limb fatigue, discomfort, and glove fit. 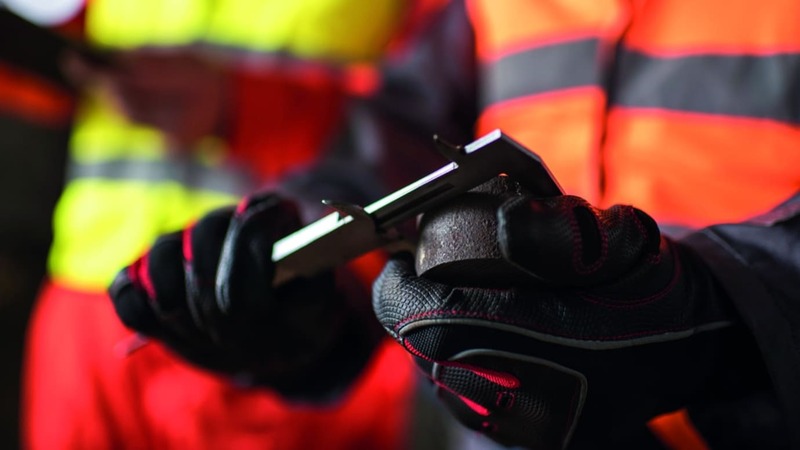 In recent years, a number of nonstandard tests have been developed for the evaluation of the ergonomic aspects of hand protection products, involving physical, physiological, and psychophysical methods7, 8, 9. It must be underlined that the current requirements provided for in the standards for protective gloves concerning assessment of compliance with Directive 89/686/EEC contain a basic reference to the evaluation of ergonomic properties. In the Central Institute for Labour Protection – National Research Institute (CIOP-PIB) a new approach to assessing the ergonomic properties of gloves was developed, taking into account factors relevant to ergonomics in PPE: biomechanical, sensory, anthropometric, thermal, and psychological. As shown in Figure 2, biomechanical measurements are crucial for the assessment. The above factors are quantified by the tests conducted according to our own methods and determination of the following parameters. Those related to the biomechanical factor – indicator of the degree of manual dexterity limitations and total dexterity limitation index – biomechanical study of the five dexterity tests (Table 1) correlated with the assessment of muscle loading (EMG) of the upper limb (Step 1). Parameters related to the sensory factor – the bending modulus of the material – a sensory test in terms of the comfort of use, determined, among others, by the material flexibility (Step 2). Parameters related to the anthropometric factor – the internal width and length of the glove, minimum and maximum allowances in the fingers – anthropometric study in terms of the dimension of gloves including arrays of anthropometric measurements of the hands (Step 3). Parameters related to the thermal factor – thermal analysis in the assessment of hygienic properties of the material and the microclimate inside the product (Step 4). Parameters related to the psychological factor – subjective comfort of work while wearing the glove – psychological research in the field to answer the survey associated with subjective feelings during the use of the product (Step 5). Positive results from steps one to five allows certification for the Ergo Gloves mark (Figure 8). The mark was registered by the European Union Intellectual Property Office (EUIPO) on 30 September 2016 under the number 015430135. The objective of the Central Institute for Labour Protection – National Research Institut was to develop a methodology for testing gloves for superior ergonomic properties specified in the document “Comfort evaluation criteria for products: Gloves with very good ergonomic properties – Ergo Gloves certification”. These criteria are more demanding than those stipulated in the relevant CEN standards and ensure greater user comfort. ERGO GLOVES certification is applicable both to protective and work gloves, as well as to gloves used for other purposes. The Ergo Gloves certification procedure consists of five steps, as seen in Figure 9. The first step is application for certification. The Applicant shall submit a copy of the completed form “Ergo Gloves Certification Request”, which clearly and unequivocally identifies the gloves concerned. The submitted documentation shall be examined for completeness and formal correctness (Step 2). The Applicant shall be notified if any formal defects in the “Ergo Gloves Certification Request” or the accompanying documents are identified. If the documentation passes formal scrutiny, it shall be passed on to the evaluator, who shall then conduct substantive evaluation. The evaluator shall ascertain whether or not the results of laboratory tests of the gloves in question meet the criteria (step 4). The successful Applicant shall be notified about passing the certification process, and shall be sent the decision to issue an Ergo Gloves certificate (step 5). The certificate shall be issued to the Applicant for a period of three years. Conclusion The Ergo Gloves trade mark informs about high ergonomic properties of gloves, which are characterised by comfort of use. This mark will be awarded by CIOP-PIB to protective gloves if they pass with positive results the laboratory assessment according to the criteria developed for that purpose, enabling buyers and users to distinguish the gloves providing high comfort of use, optimal for work requiring good tactility and dexterity. The publication has been based on the results of Phase III of the National Programme “Safety and working conditions improvement”, funded in the years 2014-2016 in the area of research and development works by the Ministry of Science and Higher Education / The National Centre for Research and Development. Koradecka, D. (ed.) Work Science – Safety, Health, Ergonomics (oryg. Nauka o pracy - bezpieczenstwo, higiena, ergonomia), CIOP, Warsaw 2002, Vol. 2 and 8. Koradecka D. (ed.) Use of Personal Protective Equipment in the Workplace, Handbook of Human Factors and Ergonomics, John Wiley & Sons Press, USA 2012, pp. 895–910. Irzmanska E., Ergonomic Gloves. The evolution of ergonomic properties, Health & Safety International, Issue 55, pp.15-25, August / September (2014). Muralidhar A., Bishu R.R., Hallbeck M.S., The development and evaluation of an ergonomic glove, Applied Ergonomics, Volume 30, Issue 6, 1 December 1999, Pages 555–563. EN 1082-2:2000 Protective clothing. Gloves and arm guards protecting against cuts and stabs by hand knives. Gloves and arm guards made of material other than chain mail. EN 420:2003+A1:2010 Protective gloves- General requirements and test methods. Larivière C., Tremblay G., Nadeau S., Harrabi L., Dolez P., Vu-Khanh T., Lara J., Do mechanical tests of glove stiffness provide relevant information relative to their effects on the musculoskeletal system? A comparison with surface electromyography and psychophysical methods Applied Ergonomics Volume 41, Issue 2, March 2010, Pages 326–334. Irzmanska E., Tokarski T., A new method of ergonomic testing of gloves protecting against cuts and stabs during knife use, Applied Ergonomics, Vol. 61, pp.102 – 114 (2017). Emilia Irzmanska Ph.D. (Eng. ), D.Sc. (Eng.) Head of the Laboratory of Hand and Foot Protection at the PPE Department, Central Institute for Labour Protection – National Research Institute (CIOP–PIB) in Warsaw, Poland.